Used in the treatment of common skin fungal infections including athlete's foot, jock itch, and tinea or ringworm infections. Per gram cream contains 20 mg ketoconazole. Apply small amount on the affected area(s) and massage cream until it is evenly distributed. 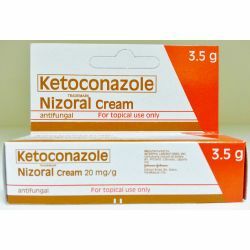 Use once daily for 2-4 weeks depending on the type or severity of skin fungal infection. Local skin irritation or burning sensation; Rarely allergic reactions.